ICWAI Admit Card June and December: ICWAI conducts ICWAI final and inter exam two times a year. Exams are conducted on June and December months. Students will wait every time eagerly download the “ICWAI Admit Card” and See their exam center. Generally Admit cards are issued 15 days before the exams. Here in this post download links of admit cards are provided. The students who admitted through online process can download their identity cards from the following link because identity card is must to write the final exams. From December 2013 term the admit card hard copy dispatch was discontinued. 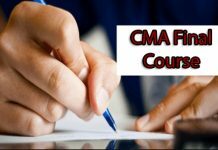 So students can download their CMA final admit card Dec 2016 from official website, the link to that is provided in this post. Go to the official website by following this link. Click the print admit card button. Enter your registration number to print the admit card. The students who admitted through online process can download their identity cards from the following link because identity card is must to write the inter exams. From December 2013 term the admit card hard copy dispatch was discontinued. 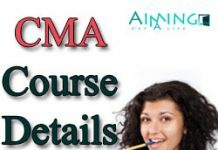 So students can download their CMA inter admit card Dec 2017 from the official website, the link to that is provided in this post. In the previous posts we gave Inter Question Papers of Previous Exams and ICWAI Study Material for Intermediate. See those posts also. Below are the download links of ICWAI Intermediate Admit card. 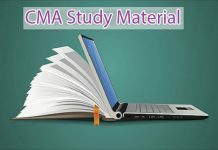 In the Previous posts we gave ICWAI Final Question Papers of Previous exams and Study Materials for ICWAI Final Exam See those posts also. 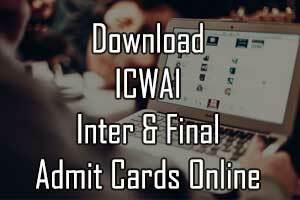 Below are the download links of the ICWAI Final Admit card. Students should download the admit cards in online. ICWAI will not send the admit cards to your home. ICWAI released a notification regarding this. Details of the notification is “physical admit cards are being sent by post, only to those who submitted physical examination forms”. They discontinued the sending the physical admit cards to the students who submitted their forms online.